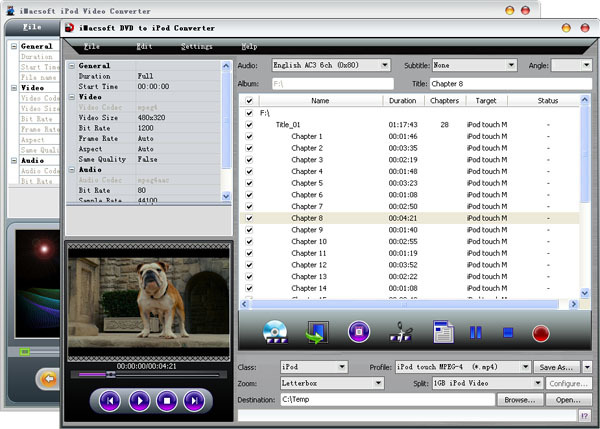 iMacsoft DVD to iPod Suite is a powerful DVD to iPod Converter and iPod Video Converter suite for Windows users to convert DVD and all popular video files to iPod video MP4 and iPod audio MP3, AAC and M4A for all types of iPod/iPhone/iPad including iPod classic, iPod shuffle, iPod shuffle 6G, iPod touch, iPod touch 4, iPod nano, iPod nano 5G, iPod nano 6G, iPhone 3, iPhone 4, iPhone 5, iPhone 5S/5C, iPhone 6/6 Plus, iPad, iPad 2, the new iPad, iPad mini, iPad 4.
iMacsoft DVD to iPod Suite includes two practical products: iMacsoft iPod Video Converter and iMacsoft DVD to iPod Converter. iMacsoft DVD to iPod Converter is easy-to-use and powerful DVD to iPod converter software for iPod classic, iPod shuffle, iPod shuffle 6G, iPod touch, iPod touch 4, iPod nano, iPod nano 5G, iPod nano 6G, iPhone 3, iPhone 4, iPhone 5, iPhone 5S/5C, iPhone 6/6 Plus, iPad, iPad 2, the new iPad, iPad mini, iPad 4. iMacsoft DVD to iPod Converter can easily convert almost all kinds of DVD movies to iPod video MPEG-4, H.264/MPEG-4 AVC and iPod audio MP3, M4A, AAC with the latest H.264 video encoding technology. iMacsoft iPod Video Converter is a powerful and easy to use iPod Video converter, which can convert video to iPod video and audio formats for iPod classic, iPod shuffle, iPod shuffle 6G, iPod touch, iPod touch 4, iPod nano, iPod nano 5G, iPod nano 6G, iPhone 3, iPhone 4, iPhone 5, iPhone 5S/5C, iPhone 6/6 Plus, iPad, iPad 2, the new iPad, iPad mini, iPad 4. It supports iPod MPEG-4 video at 640 by 480 resolution also. Free download iMacsoft DVD to iPod Suite now and enjoy your favorite DVDs and video files on all different types of iPod/iPhone/iPad! iMacsoft DVD to iPod Suite provides two personalized skins for your choice. iMacsoft DVD to iPod Converter is powerful DVD to iPod converter software for iPod classic, iPod shuffle, iPod shuffle 6G, iPod touch, iPod touch 4, iPod nano, iPod nano 5G, iPod nano 6G, iPhone 3, iPhone 4, iPhone 5, iPhone 5S/5C, iPhone 6/6 Plus, iPad, iPad 2, the new iPad, iPad mini, iPad 4. iMacsoft DVD to iPod Converter can easily convert almost all kinds of DVD movies to iPod video MPEG-4, H.264/MPEG-4 AVC and iPod audio MP3, M4A, AAC with the latest H.264 video encoding technology. iMacsoft iPod Video Converter is a powerful and easy to use iPod Video converter, which can convert video to iPod video and audio formats for iPod classic, iPod shuffle, iPod shuffle 6G, iPod touch, iPod touch 4, iPod nano, iPod nano 5G, iPod nano 6G, iPhone 3, iPhone 4, iPhone 5, iPhone 5S/5C, iPhone 6/6 Plus, iPad, iPad 2, the new iPad, iPad mini, iPad 4. iMacsoft iPod Video Converter also supports iPod MPEG-4 video at 640 by 480 resolution.